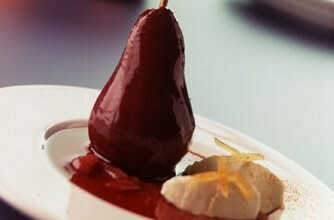 You can poach pears in white or red wine. I like red wine for winter eating – it gives a rich warm feeling. White wine offers a lighter flavour if that is what you want. The principle is the same, just make sure you use fresh pears that are just barely ripe. The directions I provide here are to preserve the fruit in jars, but you can just prepare it for immediate consumption. Any leftovers can be kept in the fridge up to 2 weeks. spices – for white wine, try 1/2 inch/ 1 cm piece of gingerroot or 1/2 vanilla bean. For red wine, try 2-3 whole star anise or a stick of cinnamon. You can also use 2 cardamon pods or 4 whole cloves for either white or red wine. Prepare the wine syrup: In a stock pot, combine red wine, sugar, water and spices. Stir to mix and heat to medium. Prepare 1 L sealer jars by filling them with boiling water. Heat sealer tops with water (the part with the rubber) in a medium pot on the stove. Bring water to boil and then keep warm. Cut pears in half and peel. Core them (using a melon baller works well to scoop out the core evenly). Add cut pears to wine syrup and poack them for as long as it takes the syrup to boil. Place pears in sealer jars gently and top jars up to within 1/2 inch / 1 com of the top. Wipe rims to ensure they are clean and then place sealer tops and rings on top and screw barely tight on jar. Once all jars are closed with lids, prepare stock pot or canning kettle 3/4 full of hot water. Place jars of pears in pot, making sure water covers jars but does not overflow. Boil for 10 minutes,, then remove from water and let cool. Jars are properly sealed when the lids go concave and will not make a noise when pressed. Label and store in a cool, dry spot. Serve pears at room temperature, with whipped cream, ice cream, or whipped Greek yogurt if desired. A small cookie (ginger thins or shortbread) makes a lovely garnish.